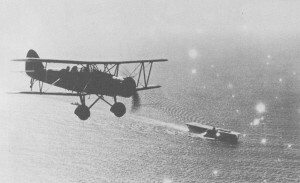 Kaga conducts air operations in 1937. On deck are Nakajima A2N, Aichi D1A, and Mitsubishi B2M aircraft. The Japanese aircraft carrier Kaga has a long history and probably we could write a full book only about her origins and actions. The Kaga was initially planned as one of the Tosa-class battleship of the Imperial Navy. However, because of the battlecruiser Amagi was damaged due to the Great Kanto earthquake in 1923, it was decided to rebuilt her as an aircraft carrier. Many modifications were done later, including the replacement of the three decks by only one deck together with improvements of her maximum speed, and more resistant deck to allow landings of modern and heavier planes. She was laid out as a Tosa-class battleship, and was launched on 17 November 1921 at the Kawasaki Heavy Industries shipyard in Kobe. However, the strict conditions of the Washington Naval Treaty forced the Japanese staff to cancel her construction on 5 February 1922. Lucky for the Kaga, the Treaty had a clause that indicated that two battleships could be transformed into carriers up to 33,000 tons. At that time, even the Americans did not understand the power of the carriers and focus only on the battleship. So, this condition seems that was benefiting the American and not the Japanese. However, he history would demonstrate the contrary. The final decision to re-build Kaga as an aircraft carrier was published on 13 December 1923, but no work took place until 1925. She was officially commissioned on 31 March 1928 but only for testing on open sea. She finally joined the Combined Fleet (Rengō Kantai) on 30 November 1929. She was the third carrier to join the Imperial Japanese Navy after Hōshō (1922) and Akagi (1927). Together with the Akagi, she also had the unique three parallel flight decks, only imitated by the British carriers with two flight decks. The Japanese aircraft carrier Kaga air group was active participating in many missions abroad even before second world war. She was supporting the Japanese ground forces in China during the Shanghai Incident of 1932 and participated in the Second Sino-Japanese War in the late 1930s. On 1 December 1931 Kaga was assigned as the flagship of the First Carrier Division under the command of Rear Admiral Takayoshi Katō. 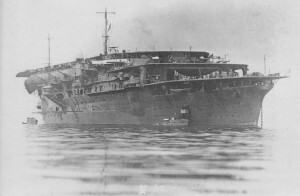 The First Carrier Division, along with Hōshō, departed for Chinese waters on 29 January 1932 to support Imperial Japanese Army troops during the Shanghai Incident as part of the IJN’s 3rd Fleet. Planes from the Kaga’s arir group, in particular the B1M3s carried were the main bombers used during the brief combat over Shanghai. It was probably the first operation launched from carriers to attack military targets in cities and military facilities. Missions in China were extended throughout February 1932. During one of these missions three of Kaga‍ ’​s Nakajima A1N2 fighters, including one piloted by future ace Toshio Kuroiwa, escorting three Mitsubishi B1M3 torpedo bombers, scored the IJN’s first air-to-air combat victory on 22 February when they shot down a Boeing P-12 flown by an American volunteer pilot. 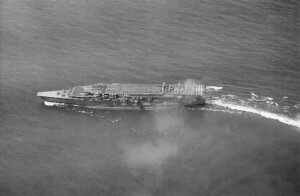 After combats and a cease-fire on 3 March, Kaga returned to home waters and continue Combined Fleet training. During these years, the IJN was changing her doctrine into a radically different one. Instead of having battleship with the main role in battle, they chose carriers as the main actors of the battle. Of course, Navy staff found many oppositions from the side of battleship supporters. The Battle of Tsushima, in which Japanese battleships defeated the Russian fleet had a strong impact in Japanese leaders at that time. In the new revolutionary view, the Kaga‍ ’​s air group had to search and attack enemy battleships with bombs and torpedoes. After some improvements of the main ideas, the aerial strikes should be done first or as a priority against enemy carriers. These analyses started around 1932–1933. The essential component in this strategy was that the Japanese carrier aircraft must be able to strike first with a massed, preventive aerial attack. Therefore, all carriers should be concentrated into a single task force. This had a good point from the offensive perspective as demonstrated in Pearl Harbour for coordination purposes. However, it had weak points because once the task force was found, all carriers could be under attack as it happened in Midway. In contrast, American task forces tend to have less carriers in each group. One reason to do that was that the American carriers could carry more planes than the Japanese ones, so Japanese needed more carrier to achieve similar attack strength. Moreover, the new Japanese strategy needed maximum speed from both the carriers and the aircraft they carried as well as larger aircraft with greater range. 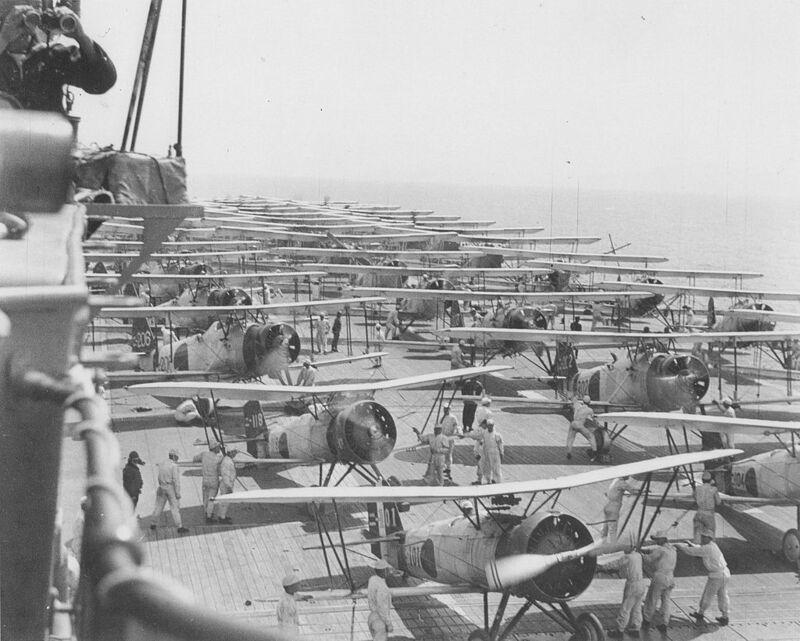 This required longer flight decks and modern heavier planes. Although may people may think that the Akagi and Kaga were identical or twins, in most trials the Kaga was judged to be inferior to Akagi. The reason for that was mainly due to her slower speed, smaller flight deck (64 feet (19.5 m) shorter), and problematic funnel arrangement. 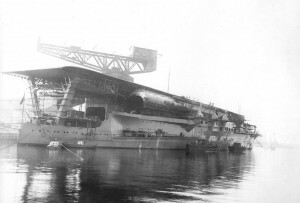 She was then scheduled for deep modernization and relegated to reserve status on 20 October 1933 to begin a second major reconstruction, transformed their two lower decks into hangars. When the Second World War started, she joined with other five carriers the Pearl Harbor operation. She took part in the Pearl Harbor raid in December 1941 and the invasion of Rabaul in the Southwest Pacific in January 1942. The following month her aircraft participated in a combined carrier airstrike on Darwin, Australia, helping secure the conquest of the Dutch East Indies by Japanese forces. She missed the Indian Ocean raid in April as she had to return to Japan for permanent repairs after hitting a reef in February. 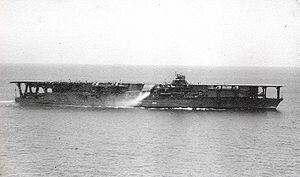 After she was completely repaired, the carrier Kaga joined again the 1st Air Fleet for the Battle of Midway in June 1942. After bombarding American forces on Midway Atoll, Kaga and three other IJN carriers were attacked by American aircraft from Midway and the carriers Enterprise, Hornet, and Yorktown. During the brave exchange of aerial attacks, dive bombers from Enterprise severely damaged Kaga. However, The air group of Kaga, in particular the CAP fighters were doing an excellent job defending the carrier against American aerial attacks. At the beginning of the battle, four remaining CAP fighters were in the process of landing when suddenly 16 Marine SBD Dauntless dive-bombers from Midway, led by Lofton R. Henderson, attacked Hiryu around 07:55 without result. Kaga fighters also helped Hiryu defensive tactics. Five D3As also joined the CAP around this time. Another trio of Zeros were launched at 08:30. Kaga began landing her returning Midway strike force aboard around 08:35 and was finished by 08:50; during the recovery planes operation, one Zero pilot died after crash-landing his aircraft. 1) The five Zeros launched at 08:15 were recovered aboard at 09:10 and replaced by six more Zeros launched at 09:20. They could intercept the first US carrier aircraft to attack, TBD Devastator torpedo-bombers of VT-8 from the US carrier Hornet at 09:22, and shot down all 15, leaving only a single survivor, George H. Gay, Jr., treading water. 2) Shortly thereafter, 14 Devastators from VT-6 from the US carrier Enterprise, led by Eugene E. Lindsey, were spotted. They tried to sandwich Kaga, but the CAP, reinforced by another six Zeros launched by Kaga at 10:00, shot down all but four of the Devastators, and the carrier dodged the torpedoes. It means that almost two completely squadrons of US Navy planes were shot down by the Kaga CAP. The Japanese staff had to feel very confident on the superiority on their pilots defending the carrier. Only a miracle could give the victory to the American side. 3) Soon after the torpedo plane attacks, American carrier dive bombers arrived over the Japanese carriers almost undetected and began their dives. At 10:22, 25 SBD Dauntless dive-bombers from Enterprise, led by C. Wade McClusky, hit Kaga with one 1,000-pound (450 kg) bomb and at least three 500-pound (230 kg) bombs. The attacks made severe damage in the ship but also killed or wounded many crew members. Captain Okada and most of the ship’s senior officers were killed by the third bomb, which hit the bridge. To add more disgrace, fueled by the gas pouring onto the hangar deck, the fires detonated the 80,000 pounds (36,000 kg) of bombs and torpedoes strewn across the hangar deck in a series of catastrophic multiple fuel-air explosions that blew out the hangar sides. 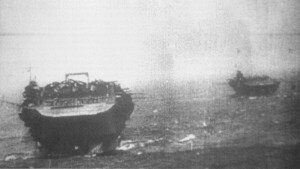 Almost simultaneously dive bombers hit and fatally damaged Akagi and Sōryū. Only Hiryu could launch a counter-attack that finally could sink the Yorktown carrier. 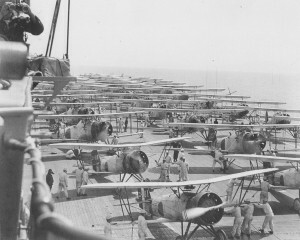 The carrier’s crew suffered 811 fatalities, mainly among the aircraft mechanics and armorers stationed on the hangar decks and the ship’s engineers. Twenty-one of the ship’s aviators were killed. although the ship lies at 350 miles (560 km) northwest of Midway Island, the main part of the carrier’s wreck has not been found. An ambitious operations was launched in May 1999 by Nauticos Corporation, in partnership with the US Navy, discovered some wreckage from Kaga. The only parts they could discover was a 50-foot (15 m) long section of hangar bulkhead, two 25 mm anti-aircraft gun tubs, and a landing light array. The elements were located at a depth of 17,000 feet (5,200 m). 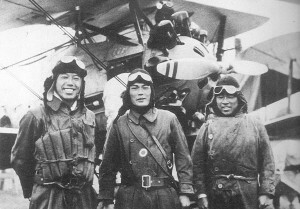 Ikuta, Kuroiwa, and Takeo pose in front of a Nakajima A1N2 Type 3 fighter aircraft. 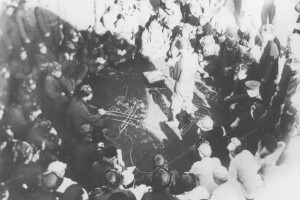 Lieutenant Ichirō Kitajima briefs his B5N crews on the carrier deck about the attack plan the day before the raid on Pearl Harbor. Kaga (foreground), with Zuikaku (background), heads towards Pearl Harbor sometime between 26 November and 7 December 1941. A Japanese Type 96 attack plane flies near Kaga during the China incident. Kaga after reconstruction showing the new, full-length flight deck above the wide battleship hull.